...and local eggs are fresh! If you grew up in Rhode Island, as I did, you likely remember that jingle. Except it was brown eggs. From Rhode Island Red hens. 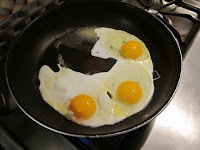 To this day, when I buy eggs I hear the jingle in my head and I always buy brown eggs. Even when there is a choice. I'm pretty sure my sister is in the same boat. One of the nurses at work got chickens. Not just a few. She got a whole flock. 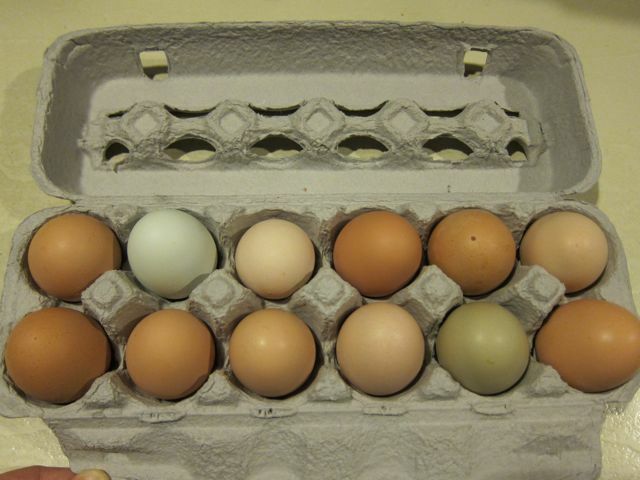 They started producing eggs a few months ago and now she gets 10-15 eggs a day. The other day, she brought in a dozen as a thank you for another nurse who did her a favor. This got me thinking, so I arranged a barter. One jar of jam (strawberry rhubarb) for a dozen eggs. Cool deal! 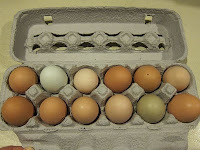 This morning we had our first locally produced eggs for breakfast. The shells were thicker and harder. They smelled more...eggy. They tasted great! We are converted. I'm thinking there will be more bartering in our future! Great, now I have the jingle in my head too. But I do buy only brown eggs.